In over 78 newly-commissioned essays, this outstanding volume provides a comprehensive and authoritative guide to the philosophy of religion. Written by many of today's leading figures, the volume surveys philosophical issues in the religions of the world, philosophical thought about religion in Western history, and important currents in twentieth-century philosophy of religion. Philip L. Quinn is John A. O'Brien Professor of Philosophy at the University of Notre Dame, Indiana, and was previously William Herbert Perry Faunce Professor of Philosophy at Brown University, Rhode Island. He is author of Divine Commands and Moral Requirements (1978), and of numerous articles in philosophy of religion, philosophy of science, theoretical physics, religious ethics, metaphysics, epistemology, value theory, political philosophy, and philosophy and literature. He has served as editor of the journal Faith and Philosophy (1990-5); as President of the Central Division of the American Philosophical Association (1994-5); and as Chair of the National Board of Officers of the American Philosophical Association (1995-9). Charles Taliaferro is Associate Professor of Philosophy at St Olaf College, Minnesota. He was Visiting Scholar at Oriel College, Oxford, and has taught at Brown University, the University of Massachusetts, and the University of Notre Dame, Indiana. He is the author of Consciousness and the Mind of God (1994) and Contemporary Philosophy of Religion (Blackwell Publishers, 1997), and numerous papers in philosophy of religion, metaphysics, and ethics. Introduction: Philip L. Quinn & Charles Taliaferro. Part I: Philosophical Issues in the Religions of the World:. 1. Hinduism: Ninian Smart (University of California, Santa Barbara). 2. Buddhism: Paul J. Griffiths (University of Chicago). 3. Chinese Confucianism and Daoism: Chad Hansen (University of Hong Kong). 4. African Religions: Kwasi Wiredu (University of South Florida). 5. Judaism: Lenn E. Goodman (University of Hawaii at Manoa). 6. Christianity: William J. Wainwright (University of Wisconsin). 7. Islam: Azim Nanji and Aziz A. Esmail (University of Florida). Part II: Philosophical Theology and Philosophy of Religion in Western History: . 8. Ancient Philosophical Theology: Kevin Flannery (Pontifica Universita Gregoriana). 9. The Christian Contribution to Medieval Philosophical Theology: Scott Macdonald. 10. The Islamic Contribution to Medieval Philosophical Theology: David Burrell, CSC, (University of Notre Dame). 11. The Jewish Contribution to Medieval Philosophical Theology: Tamar Rudavsky (Ohio State University). 12. Early Modern Philosophical Theology: Derk Pereboom (University of Vermont). 13. The Emergence of Modern Philosophy of Religion: Merold Westphal (Fordham University). Part III: Some Currents in Twentieth Century Philosophy of Religion:. 14. American Pragmatism: Nancy Frankenberry (Dartmouth College). 15. Personalism: Patricia A. Sayre (St Mary's College, Notre Dame). 16. Process Theology: David Ray Griffin (School of Theology, Claremont). 17. Phenomenology and Existentialism: Merold Westphal (Fordham University). 18. Wittgensteinianism: John Hyman (University of Oxford). 19. Thomism: Ralph McInerny (University of Notre Dame). 20. The Reformed Tradition: Nicholas Wolterstorff (Yale University). 21. The Anglican Tradition: Canon Brian Hebblethwaite (University of Cambridge). 22. The Jewish Tradition: Robert Gibbs (Princeton University). 23. The Orthodox Tradition: Paul Valliere (Butler University). Part IV: Theism and the Linguistic Turn:. 24. Religious Language: Janet Soskice (University of Cambridge). 25. The Verificationist Challenge: Michael Martin (Boston University). 26. Theological Realism and Antirealism: Roger Trigg (University of Warwick). Part V: The Theistic Concept of God: . 27. Being: C. J. F. Williams (University of Bristol). 28. Omnipotence: Joshua Hoffman and Gary Rosenkrantz (University of North Carolina at Greensboro). 29. Omniscience: George I. Mavrodes (University of Michigan). 30. Goodness: Paul Helm (University of London). 31. Simplicity: Eleonore Stump (St Louis University). 32. Eternity: Brian Leftow (Fordham University). 33. Necessity: William E. Mann (University of Vermont). 34. Incorporeality: Charles Taliaferro (St Olaf College). 35. Beauty: Patrick Sherry (University of Lancaster). 36. Omnipresence: Edward R. Wierenga (University of Rochester). 37. Foreknowledge and Human Freedom: Linda Zagzebski (Loyola Marymount University). 38. Divine Action: Thomas F. Tracy (Bates College). 39. Creation and Conservation: Hugh J. McCann (Texas A&M University). 40. Immutability and Impassibility: Richard E. Creel (Ithaca College). Part VI: The Justification of Theistic Belief: . 41. Ontological Arguments: Celement Dore (University of California at Santa Cruz). 42. Cosmological Arguments: William L. Rowe (Purdue University). 43. Teleological and Design Arguments: Laura L. Garcia (Rutgers University). 44. Moral Arguments: C. Stephen Evans (Calvin College). 45. Pragmatic Arguments: Jeffrey Jordan (University of Delaware). 46. Miracles: George N. Schlesinger (University of North Carolina). 47. Religious Experience: Keith E. Yandell (University of Wisconsin). 48. Fideism: Terence Penelhum (University of Calgary). 49. Reformed Epistemology: Alvin Plantinga (University of Notre Dame). Part VII: Challenges to the Rationality of Theistic Belief:. 50. The Problem of Evil: Michael L. Peterson (Asbury College). 51. Naturalistic Explanations of Theistic Belief: Kai Nielsen (Concordia University). 52. The Presumption of Atheism: Antony Flew (University of Oxford). Part VIII: Theism and Modern Science: . 53. Theism and Physical Cosmology: William Craig (University of Brussels). 54. Theism and Evolutionary Biology: William Hasker (Huntington College). 55. Theism and the Scientific Understanding of the Mind: Robert Audi (University of Nebraska). 56. Theism and Technology: Frederick Ferre (University of Georgia). Part IX: Theism and Values:. 57. Divine Command Ethics: Janine Marie Idziak (Loras College). 58. Natural Law Ethics: Robert P. George (Princeton University). 59. Virtue Ethics: Jean Porter (University of Notre Dame). 60. Narrative Ethics: Robert C. Roberts (Wheaton College). 61. Agapeistic Ethics: Gene Outka (Yale University). 62. Theism, Law, and Politics: Paul J. Weithman (University of Notre Dame). 63. Theism and Medical Ethics: James F. Childress (University of Virginia). 64. Theism and Environmental Ethics: Gary L. Comstock (Iowa State University). 65. Theism and Toleration: Edward Langerak (St Olaf College). Part X: Philosophical Reflection on Christian Faith:. 66. Trinity: David Brown (University of Durham). 67. Incarnation: Ronald J. Feenstra (Calvin Theological Seminary). 68. Sin and Original Sin: Philip L. Quinn (University of Notre Dame). 69. Atonement, Justification, and Sanctification: John E. Hare (Calvin College). 70. Survival of Death: Stephen T. Davis (McKenna College, Claremont). 71. Heaven and Hell: Jonathan L. Kvanvig (Texas A&M University). 72. Providence and Predestination: Thomas P. Flint (University Notre Dame). 73. Petitionary Prayer: Eleonore Stump (St Louis University). 74. Revelation and Scripture: William J. Abraham (Southern Methodist University). 75. Tradition: Basil Mitchell (University of Oxford). Part XI: New Directions in Philosophy of Religion:. 76. Feminism: Sarah Coakley (Harvard University). 77. Religious Pluralism: John Hick (University of Birmingham). 78. Comparative Philosophy of Religions: Paul J. Griffiths (University of Chicago). 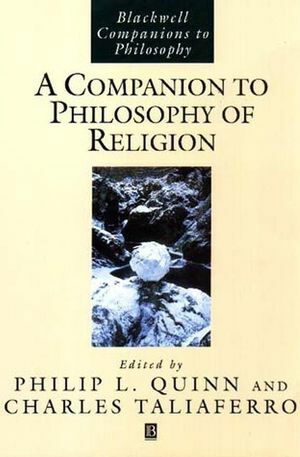 * The definitive guide to the philosophy of religion. * Written by the leading figures in the field. * Over 75 newly-commissioned articles.